One of the biggest online bingo sites is Bet365 Bingo and they too have jumped onto the television commercial bandwagon and have, with the help of their promotions and advertising team, come up with quite an unusual advertisement. 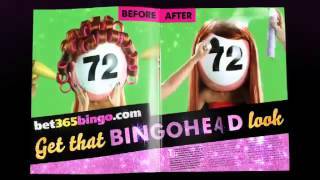 This television advertisement is based around a typical glossy magazine advert it gets everything out there, and cleverly plays on the slogan ‘Get That Bingo Head Look’, with all of the actors having their heads replaced with bingo balls. The advert then goes on to mention but quite briefly their special £25 bonus which is given to you when you buy and play just £5 worth of real money bingo tickets at their online bingo site, overall it is quite a memorable type of bingo advert. They have chosen to stick with this Bingo Head type of theme on several of their other television advertisements and as such look out for several different versions of this commercial which you cannot help but remember. To ensure you are always up to date with their current promotional offers, which we should point out can change at any time, we suggest you take a look over at their website as this is where their current, and we have to say very generous bingo promotion is displayed, giving you plenty of extra free bingo cash to play any of their many bingo games, which include plenty of large paying jackpot games.